Rather a sad title for this Phuket weather update. It's a lyric from the Simon and Garfunkel song 'April Come She Will'. As you may have read on the last update (August 12th), I was in England for 3 weeks from mid July to stay with my Mum who has cancer again. I came back to Phuket on August 6th. I'm going back to England again next week and hoping Mum will still be alive when I get there. Her 70th birthday is tomorrow, August 25th. Or use any of the links on the left of the page for weather information. And for photos and regular Phuket news and weather updates, please do follow me on Twitter and Instagram. Let's start with today - August 24th. 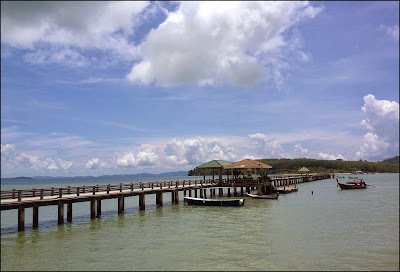 Hot start to the day, I did my morning walk at Bang Wad Reservoir, dark clouds did appear, but we still had decent weather when we went for lunch at Laem Hin Seafood. There was some rain around during the day, but we missed it. If you see dark clouds, if it's raining where you are ... take a drive! Head towards the brighter skies - the rain is often very localised in the Phuket area. August 23rd - decent weather, mostly sunny. A morning at home, we had electricians in the house fitting 2 new water heaters in our bathrooms, then we headed into Phuket Town, kids for art class and my wife and I to drink coffee! We tried a new place called the "B Cat Cafe", which has cats in the cafe - it was OK, maybe a tad overpriced and then a longer sit with coffee at Since 1892, a nice place on Thalang Road. August 21st - a Tweet said "Phuket weather today : kind of grey, not sunny, not wet, not too grey"
Some low season days are nice, some are not, and some are just kind of grey. August 20th - I must have been busy at work because my only Tweet for the day said "Morning weather in Phuket : grey. Rained a bit during the night." 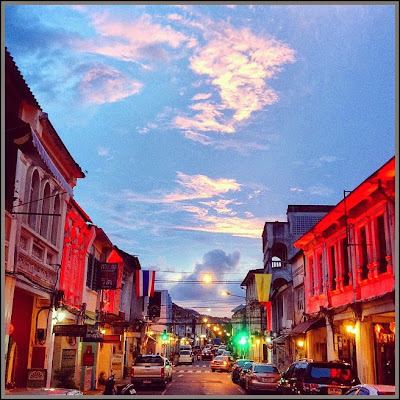 August 19th - "Phuket weather this morning - lovely and sunny, though I did see a dark cloud hovering over the hills." August 17th - lovely hot sunny day. And a very lazy day including several beers at a friend's house while our kids played guitar. August 16th - My first Tweet of the day : "Really really wet morning at my house in Phuket .. heavy rain for hours, thunder, no sign of a let up yet." (above) August 16th at Layan Beach after a wet morning ... don't let the rain deter you for having a good day, it's not raining everywhere! 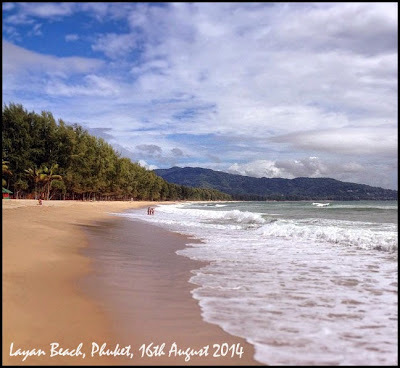 I've just posted a new blog post on Jamie's Phuket about Layan Beach. August 15th - WET! Very wet. Well, I saw photos online of flooded roads in Patong, but I drove 20km to work at Karon beach and did not see any floods myself. But yes it was a wet morning! August 13th "Weather this morning ... undecided. Sun and dark clouds. Probably raining in some parts of Phuket, but sunny at my house :)"
IMPORTANT - If you are in Phuket in the low season and it's raining where you are ... MOVE! Hire a car, take a taxi, take a trip, it might well be nice weather if you drive 20 minutes. Sure there are plenty of things to do on a rainy day in Phuket, but do keep in mind that it's not going to be wet everywhere and not going to be wet all day. I'll be off to England next week, and not 100% sure when I will be back. Some time in September. Hopefully in time for the Phuket Vegetarian Festival which starts September 23rd. If you are coming to Phuket soon, enjoy!